Mick Sims writes dark fiction as a team with Len Maynard. Len Maynard (1953) and Mick Sims (1952) have been writing together for a long time. They met in 1964, aged eleven, at Ambrose Fleming Technical Grammar School in Ponders End, Enfield. They weren’t friends immediately, that came later, when, aged 18, they had left school and started work – Len Maynard as a lapidary in London and Mick Sims for Lloyds Bank. They both still work for the same employers. They began to talk one night, in the bar of the Crown & Horseshoes pub in Enfield, went for a long walk after closing time, and a life time of friendship was born. Mick Sims is married to Clare, Len Maynard isn’t married to anyone any more, and there are two children between them, Iain Maynard and Emily Sims. They both live in Hertfordshire, about 25 miles apart. They began writing in 1972 with short horror stories that were either Pan Horror type stuff or very atmospheric mood pieces. Our first sales were in 1974, with Curtain Call to London Mystery Magazine for £7 and a second story, Benjamin’s Shadow to Hugh Lamb for his Taste Of Fear anthology. Hugh has remained a lifelong friend. Their writing history settles into four main periods – the early traditional ghost story period of about ten years from 1974: a middle period when they wrote a lot without sending much off for possible publication. During this period they wrote and broadly destroyed about 11 novels, and wrote numerous stories. This ‘barren’ period lasted about ten years from about 1984. The third period began around 1994 and is when they began again in earnest and happily continues to the present day. The fourth ten year period began around 2004 with the publication of what currently is their most recent story collection, Falling Into Heaven. This phase is dominated by novels. They write supernatural thrillers but are branching out into crime and adventure as well. Their first two supernatural novels, Shelter (2006), and Demon Eyes (2007) were published by Leisure in USA. The third, Black Cathedral, is the first Department 18 book, published early 2009, and as is the fourth, Night Souls. Mick Sims and Len Maynard have completed two supernatural thrillers and are currently working on the third Department 18 novel. They have also completed an adventure thriller and a crime thriller and are currently working on a third thriller. Collections include, Shadows At Midnight, 1979 and 1999 (revised and enlarged), Echoes Of Darkness, 2000, Incantations, 2002, two retrospective collections of their stories, essays and interviews, The Secret Geography Of Nightmare and Selling Dark Miracles, both 2002, one introduced by Hugh Lamb and the other by Stephen Jones, and Falling Into Heaven in 2004. Novellas, Moths, The Hidden Language Of Demons, The Seminar, and Double Act, have been published in 2001, 2002, 2003 and 2007 respectively. 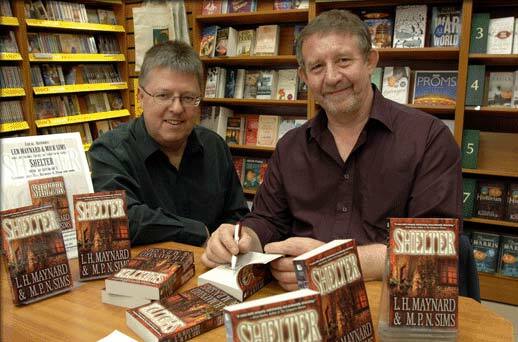 Len Maynard and Mick Sims worked as editors on the first seven volumes of Darkness Rising, and the two annual Darkness Rising anthologies. They co-edited and published F20 with The British Fantasy Society. As editors/publishers they ran Enigmatic Press in the UK, which produced Enigmatic Tales, and its sister titles. They wrote essays for the Mark Chadbourn website At The World’s End. You can find all Gothic.net articles and fiction relating to Mick Sims at tag Mick Sims.